What do you get when two you combine the innovative brainwaves of French director Michael Gondry (Eternal Sunshine of the Spotless Mind, The Science of Sleep) with that of esteemed American linguist, philosopher, cognitive scientist, logician, political commentator and activist Noam Chomsky? You get an animated documentary film in which challenges the mind and provokes thoughts to arise within the deepest spectrums of our psyches we never knew were there, with a unique choice of aesthetic. 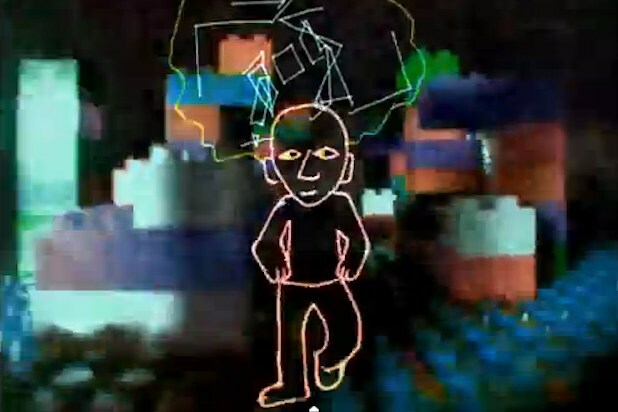 Released in February 2013 and directed, written and animated by Gondry, he uses his own drawings to allow complex ideas into more accessible and tangible ones to expand the forum of the documentary to its fullest extent. Painstakingly taking two years of his life to doodle each and every sketch to match the soundtrack of the learned wisdom of Chomsky, Gondry indeed pulled off yet another feat with his original, audacious and colorful animation. So, is the man who is tall really happy? Let’s take a look. It was twice in 2010 that Gondry met with Chomsky for a series of conversations about his deep knowledge in philosophy, linguistics and also for a glimpse through the window into the author’s childhood in Philadelphia. Gondry was inspired by picking up the work of Chomsky in a New York bookshop. Deciding to first record talks with the professor at MIT, where Chomsky teaches, Gondry then used those discussions as a springboard for animated explorations of their content. Chomsky says at one point in the film, “If you’re willing to be puzzled, you’re able to learn,” a concept he stands by as he grows. Even an intelligent man like Chomsky can be confused, it seems, and through this, we as the audience learn quite a lot indeed. Even though no one specifically asked or confronted Gondry to create a 16mm animated documentary about one of the most prominent thinkers in society, he explains that he was looking for a project to occupy his free time while editing The Green Hornet and producing Mood Indigo. As we the audience are seeing the ideas and theories of Chomsky come to life on the screen through the animation of Gondry, what we are actually viewing is the interpretation of those ideas and theories as Gondry depicts them. The drawings show themselves to be vivid and playful, but also a tad crude. But one cannot blame a director he intrepidly keeps us intrigued with his dancing and lively animation at 24 frames per second. Not all of the movie is theory and concept. We actually meet Chomsky halfway into the picture. H speaks of growing up with an academic “Zionist” father in Philadelphia, his experience in a grade school, the terror of race riots during WWII—filling the rounded portrait of an intensely guarded but affable man. Near the end of the film, in the sole musical portion (scored to Mia Doi Todd’s “I Gave You My Home”), Gondry pays a poignant homage to Chomsky’s wife of 59 years, Carol, who passed away in 2008. It appears that the man, Chomsky, is tall but not so happy, due to the death of his wife. At the end of the movie, it seems that, perhaps for the first time, the two men with very different minds might finally be on the same page. At 89 minutes, one might argue that that is too much time to be listening to a great thinker discuss theorems and ideologies of scientific concepts. In its nicest and truest form, the film plays out as a cool after school meeting with that certain professor you’ve always admired. Chomsky and Gondry, although mismatched on paper, share an odd but genuine chemistry when it switches back to real life. The animation was truly a labor of love, dedicated solely to his “professor” that Gondry, the “pupil,” looked upon with admiration and respect. Stylistically capturing beautifully abstract and yet sophisticated drawings to clarify Chomsky’s occasional drivel, Is The Man Who Is Tall Happy? is indeed a creative and colorful sojourn into the kaleidoscopic minds of a modern linguist and a director’s whimsical and whirring animation. Seven theories out of 10. God’s Not Dead 2 Coming This Spring! November 23, 2015 Cora Dickey Comments Off on God’s Not Dead 2 Coming This Spring!